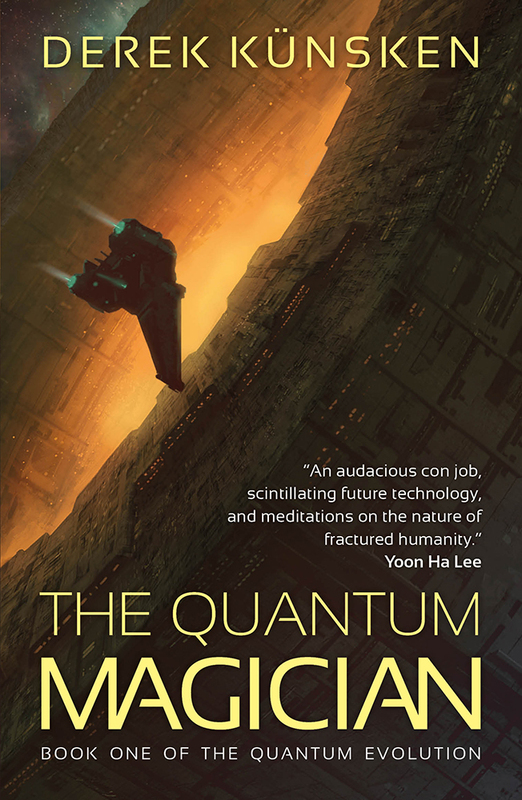 Derek Künsken makes clear right from the outset that The Quantum Magician is a heist story. Belasarius is a self-confessed conman who is contracted to do the impossible – get a fleet of warships carrying game changing technology through a protected wormhole without being captured or destroyed. In order to do carry out his plan he puts together a team of misfits. Künsken leans heavily into heist tropes as Belasarius recruits an old flame, an crazy AI, an old mentor, a slightly unhinged demolitions expert, a geneticist and representatives of each of humanity’s new genetic branches. The Quantum Magician then follows Belasarius and his crew through the heist with its requisite double and triple crosses and unexpected turns. Künsken uses the heist as a scaffold on which to do a prodigious amount of universe building. He introduces four new human species – homo quantus (of which Belasarius is one) who have the capacity to go into a fugue state and see quantum-based probabilities, Puppets (who are genetically programmed to serve and worship another human subspecies called Numen) and Mongrels, descendants of ancient settlers genetically altered to be able to live in the extreme depths of icy interplanetary oceans. The key to a good heist story is confounding the expectation of the readers. Readers have to have a sense of how things are supposed to work to appreciate the twists and turns that the con artist is navigating through. The Quantum Magician partly frustrates this intent by requiring an understanding of too many new concepts, species and situations before being able to appreciate the intricacies of the heist itself. So that while there is some fun to be had here and some genuinely tense moments, Künsken makes it hard to really invest in this gang of thieves. This review first appeared in Aurealis #114, Australian Science Fiction and Fantasy Magazine, www.aurealis.com.au.